Oh also, the other part of the game is when everyone forgets their differences for a bit to kill the fascists that are invading from the Risk game. Bakunin, Kropotkin, and Goldman were three 19th-20th century revolutionary anarchists. The anarchists wish to dismantle all illegitimate power structures in society, such as class, gender roles, and government. The philosophy shares a lot in common with Marxism, which also aims towards a stateless, classless society, but the anarchists place higher priority on eliminating state power. In particular, Marxist-Leninists believe that a transitionary state is necessary (particularly in Russia at the time), while the Anarchists believe in eliminating all authority immediately. Like the comic implies, there were some differences between them. Bakunin was an Anarcho-collectivist, meaning that the resources of society would be collected, and democratically and equally distributed among the population. So everyone would work, and for their labor they would receive "labor vouchers" which they could exchange for which goods they wanted. 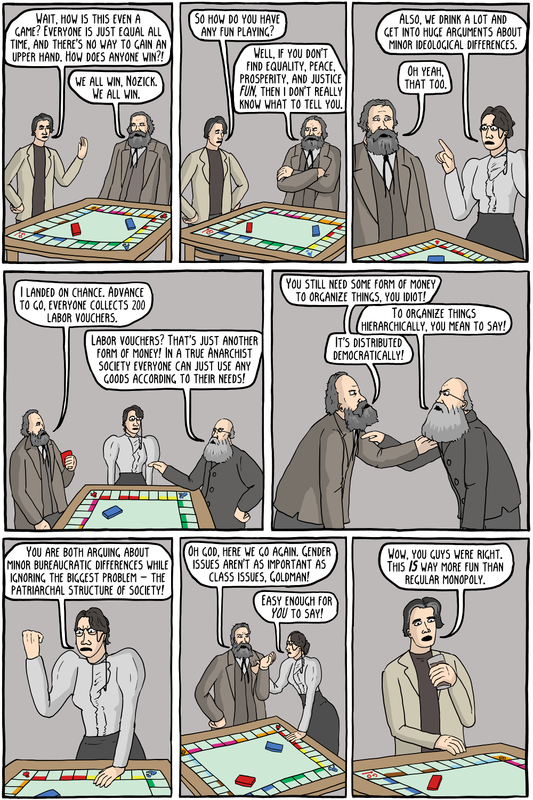 Kropotkin and Goldman were anarcho-communists, believing in eliminating money altogether, and society should be formed from purely mutual aid and cooperation. While most anarchists are radical feminists, Emma Goldman was much more focused on gender issues than the other two, for reasons you can probably imagine. This maybe shouldn't be exaggerated too much however, as she also fought her entire life to criticize capitalism, and authoritarian communism, as well as patriarchal oppression. Noam Chomsky has a pretty good lecture on what anarchism is, and how it developed. Robert Nozick was a sort of right-wing American anarchist (often called Libertarianism today). He believed in the elimination of almost all state power, thinking that only a minimal state which would provide security against violence and enforce contracts should exist, but it should not have the authority to override any individual choices of the citizens. 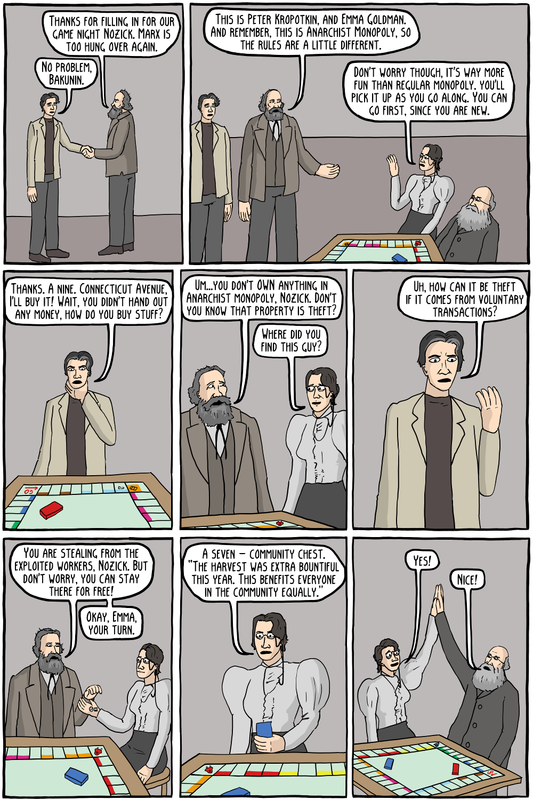 Unlike the anarchists however, he did not believe that private ownership of the means of production should end (i.e., it is perfectly legitimate to have people who own factories). The reason he thought this was that the ownership arises from free choices of individuals. So for example, the employees and employer both mutually agree to form the employment contract, so it is illegitimate for any kind of State to interfere in free choices. The logical conclusion to this, which Nozick took up, was that even minimum wage laws are illegitimate, because they prevent two individuals from coming to mutual agreements. The original anarchists found this sort of relationship to be another form of oppression, because the workers don't have a real choice, seeing as they must work in order to live. Real freedom, for them, only arises when the means of productions are socially owned.